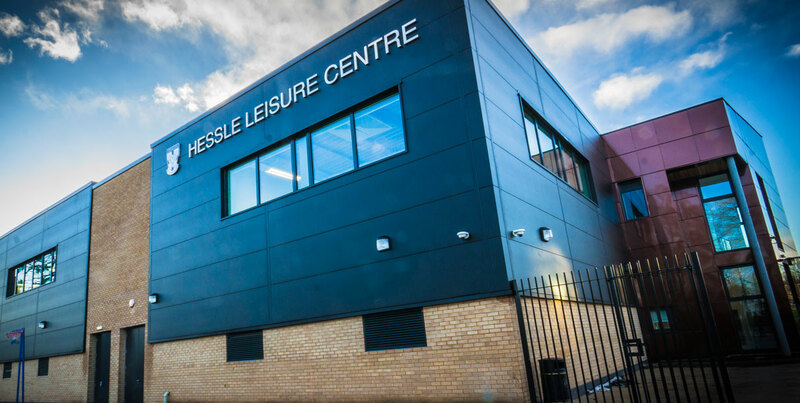 A $2.4 billion project to rebuild and refurbish 260 schools in England is underway with the latest project clad in Alucobond aluminum composite material (ACM). The endeavor is part of an initiative known as the Priority School Building Program (PSBP) and is overseen by the Department for Education (DfE). Each project takes an estimated 11 to 18 months to complete and all schools are due for completion by the end of 2017 – two years ahead of schedule. The short-term goal is to achieve the best schools for students, while over the long-term building a stronger economy and an equal society. The first school, Whitmore Park Primary School, was completed in December 2014 and quickly became the model for all subsequent schools. The Primary School proved the project could be completed ahead of schedule at a lower cost than previous government programs. 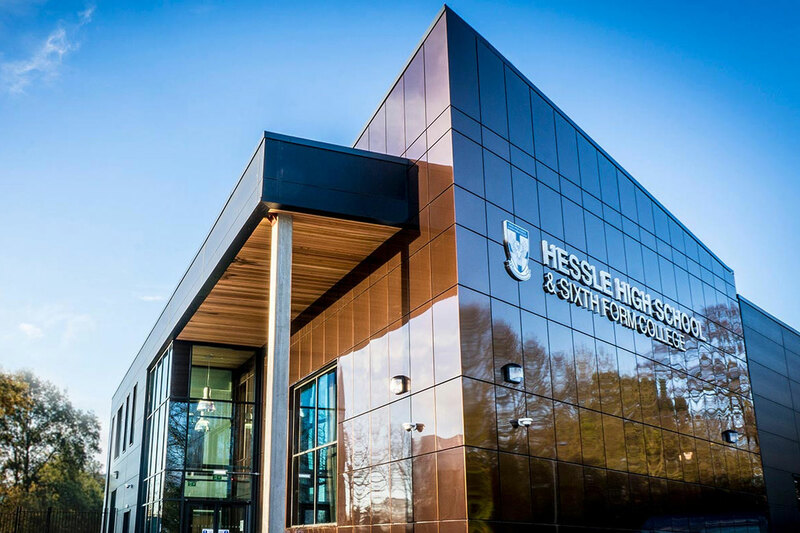 Hessle High School and Sixth Form College in East Yorkshire, designed by Sotech a leading fabricator of engineered metal rainscreen cladding, began shortly after the success of Whitmore. 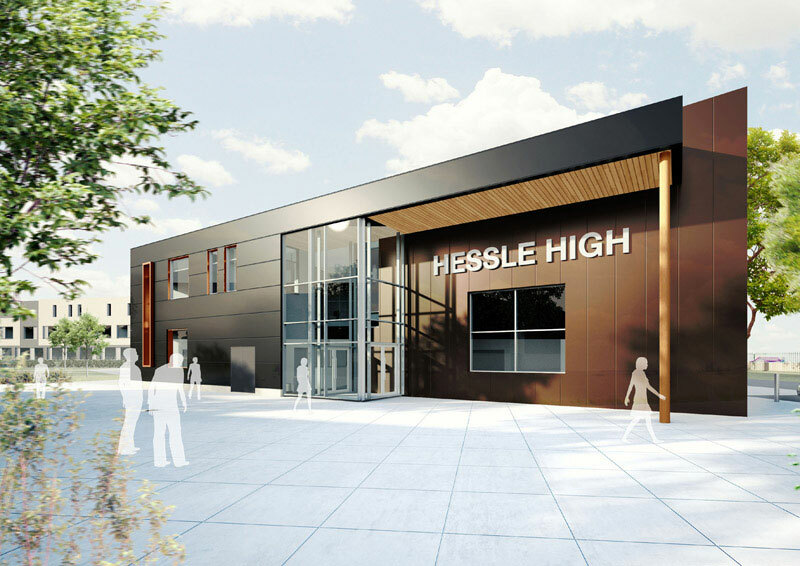 The refurbished Hessle High School and Sixth Form College, with the direction of the architects at DLA Design, consolidated two sites into one and introduced new science labs, teaching areas, and sporting facilities on an $18.5 million budget. The school accommodates 1,550 pupils, 230 of which are students of Sixth Form College. The project called for 4mm Alucobond ACM in Midnight Copper – a color available in the UK – and a rain screen attachment system. The popular installation method gives a finish that is clean and modern. Sotech partnered with Chemplas Limited, an installer, to specify over 1,600 feet of Alucobond panels to be installed in vertical recesses. The paneling worked well within Sotech’s Optima TFC system. The branded rainscreen system by the experts at Sotech ensures a pristine appearance complete with discreet color matching fixings in each panel recess. The Midnight Copper color has the dazzling effect – which all spectra colors offer – of iridescent highlights and a sparkling finish. Each new school means less money has to be spent on repairs and more money can be spent on better equipment and increased staff. Schools showing the most urgent needs suffered from poor heating and cooling, leaking roofs and aging technology. The new schools ensure inspirational learning environments and offer educational excellence. The schools are making a significant impact on their communities and the project has been deemed such a success that administrators have announced a second phase worth $2 billion more with 277 schools in line.